The arms were borne by François-Saturnin Lascaris d’Urfé (1641-1701), a Sulpician missionary and the first resident priest of Saint-Louis-du-Haut-de-l’Île, the site of the present-day town of Baie-d’Urfé. 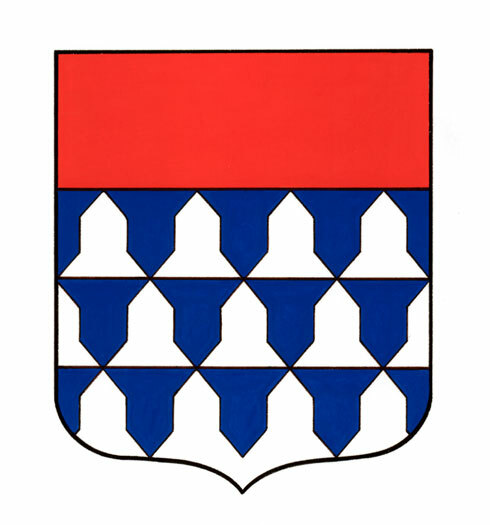 The last member of the Lascaris d’Urfé family died in 1794, and the town has used the arms since 1960 to honour its association with the family. The unusual arrangement of the vair pattern at the base of the arms replicates their rendering on a silver cup once owned by François-Saturnin Lascaris d’Urfé, now in the collection of the Notre-Dame Basilica of Montreal. According to tradition, the arms were granted to Wlphe le Robuste, the progenitor of the family of Lascaris d’Urfé, to honour his participation in the Siege of Antioch in 1098. In battle, Wlphe wore a coat of scarlet lined with squirrel fur, the heraldic “vair”, and this coat inspired the design.